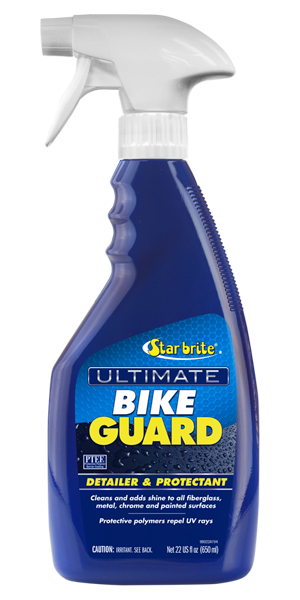 Star brite’s ULTIMATE Bike Guard with PTEF® lets you detail and shine the bike in minutes while also adding a protective PTEF® polymer barrier against damaging UV rays and grime to keep it looking good. Spray it onto the bike or a cloth, wiping it evenly across the surface, then lightly buff to reveal a clean, shiny, “bike show quality” finish. Ideal for cleaning and enhancing the appearance of all stainless, chrome and painted surfaces, as well as plastic, rubber and leather. Shake bottle before use. Spray directly onto surface to be shielded. Wipe up any overspray with a paper towel or a cloth. Use as needed to maintain a barrier against moisture and corrosion. Star brite’s liability is limited to the purchase price of this product.